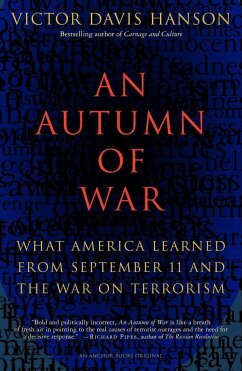 On September 11, 2001, hours after the terrorist attacks on New York and Washington, the eminent military historian Victor Davis Hanson wrote an article in which he asserted that the United States, like it or not, was now at war and had the moral right to respond with force. 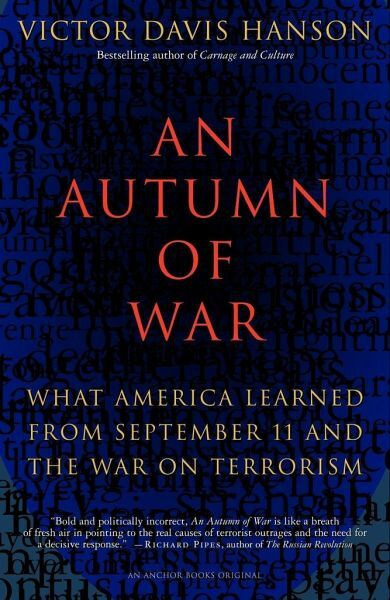 An Autumn of War, which opens with that first essay, will stimulate readers across the political spectrum to think more deeply about the attacks, the war, and their lessons for all of us. Victor Davis Hanson was educated at the University of California, Santa Cruz, and the American School of Classical Studies at Athens, and received his Ph.D. in Classics from Stanford University. He farmed full-time for five years before returning to academia in 1984 to initiate a Classics program at California State University, Fresno. Currently, he is the Martin and Illie Anderson Senior Fellow in Residence in Classics and Military History at the Hoover Institution, Stanford University. Hanson has written articles, editorials, and reviews for the New York Times, Wall Street Journal, Daily Telegraph, International Herald Tribune, American Heritage, City Journal, American Spectator, National Review, Policy Review, The Wilson Quarterly, The Weekly Standard, and Washington Times, and has been interviewed on numerous occasions on National Public Radio and the BBC, and appeared with David Gergen on The NewsHour with Jim Lehrer. He writes a biweekly column about contemporary culture and military history for National Review Online. He is also the author of some eighty scholarly articles, book reviews, and newspaper editorials on Greek, agrarian, and military history, and contemporary culture. He has written or edited eleven books, including The Western Way of War, The Soul of Battle, and Carnage and Culture. He lives and works with his wife and three children on their forty-acre tree and vine farm near Selma, California, where he was born in 1953.